One of Charles Darwin's lesser-known experiments, on the expression of emotion, is being re-run as an exercise in online crowdsourcing - and anyone can take part. In 1868, Charles Darwin undertook a study to prove that humans, like animals, have an innate and universal set of emotional expressions - a code by which we understand each other's feelings. The Darwin Correspondence Project, which is working to publish and digitise thousands of the scientist's letters, has recreated the experiment nearly 150 years later - to test his results, and draw attention to his contribution to psychology. The experiment took place in the living room of Down House, Darwin's country home in Kent, during a series of dinner parties from March to November 1868, where he asked guests for their responses to photographs of a man with his face frozen into a range of different positions. This was followed by a questionnaire that was distributed around the world - one of the first questionnaires ever printed. "Mr Darwin brought in some photographs taken by a Frenchman, galvanising certain muscles in an old man's face, to see if we read aright [sic] the expression that putting such muscles in play should produce," wrote one of the guests in a letter to her sister. It was somewhat unscientific by modern standards, with no control group and a very small sample, but it was revolutionary for its time. "It was typical of Darwin that he used what was to hand," says Dr Alison Pearn of the Darwin Correspondence Project. 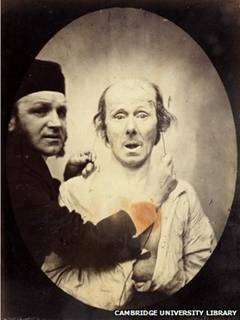 He used 11 black and white photographs originally taken by French anatomist Guillaume-Benjamin Duchenne, to examine the movement of facial muscles. According to Duchenne, the subject was "an old, toothless, man with a thin face, whose appearance, without being precisely ugly, was more or less nondescript". His "intelligence was limited", he added. Duchenne used electrodes to manipulate the muscles on the man's face and contort them into various expressions. While he appears to be in some pain, Darwin later wrote that the man was "little sensitive", as he had a medical condition that left his face numb. 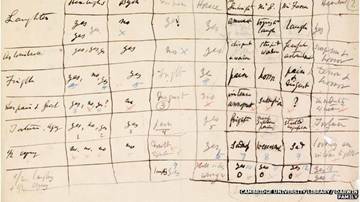 Darwin showed the photographs to each of his guests individually, asking them what emotion the subject was feeling and collected their responses on a table, hastily scribbled on scrap paper. According to these notes, his subjects agreed almost unanimously on certain photographs - those that betrayed fear, surprise, happiness, sadness and anger. After the experiment Darwin distributed a questionnaire around the world - he couldn't send the pictures themselves as they were very valuable. He asked about facial expressions and gestures such as shrugging and blushing among different cultures. He had a vast network of correspondents - more than 2,000 in his lifetime - and received replies from travellers and missionaries as far as South Africa, India, China, North America, and Australia. Darwin wanted to prove that there is a series of "cardinal" emotions that are expressed and perceived by all humans in the same way, and that these are innate or biological. The study formed part of his 1872 book The Expression of Emotion in Man and Animals in which he outlined his view that expression was a trait that humans shared with beasts. He wanted to disprove one of the arguments against his theory of evolution - that the ability to feel, express and read emotion is unique to humans (so they could not have descended from apes). But how accurate were his results? That is what Dr Pearn and her team have set out to discover. They have created an interactive online tool that allows the public to look at each of the 11 portraits and give their own interpretations of the Frenchman's expression. They will collate the responses and see whether the results from Darwin's small sample match their findings. One interesting feature of Darwin's experiment is that he seems to have honed his method as he went along. At the beginning he offered his subjects a Yes/No option, but as the study progressed he began soliciting a whole range of responses. His experiment evolved into a "single-blind" study - one which doesn't lead the subject to any particular response. For the modern incarnation of the project, which will have a vastly bigger sample unit, this raises some problems - how to group the findings when the list of responses is unlimited. To get around these issues the Darwin project has teamed up with the Computer Laboratory, another Cambridge-based project, which for the past two years has been using web-based tools to study people's response to facial expression. They are developing a bank of common human emotions which will be used to programme computer systems - such as teaching tools or satellite navigation - to recognise human expressions. "The Expression of Emotions in Man and Animals was the seminal work in the field back when it was written in 1872," says Peter Robinson who heads the project. "Of course we all read it when we started working on this." His project uses video images of real people evoking natural expressions and asks viewers to name them. Like Darwin's study, it was developed to get as wide a sample as possible, regardless of cultural issues such as age, race or gender. Today, few psychologists disagree with Darwin's theory of a universal set of expressions - it has formed the basis for an entire canon of psychological study. But it was overlooked for nearly 100 years. It wasn't until the 1960s, that the experiment was revisited by psychologist Paul Ekman, who started out trying to disprove Darwin, but obtained results that merely backed him up. Ekman travelled around the world showing photographs of facial expressions to people in various cultures, the majority of cultures tested read the five core emotions in the same way. One of the major problems with Darwin's study was the fact the expressions were unnaturally evoked. Photography was a new process and it was difficult to capture movement so expression had to be posed and held in position. The same problem presents itself today as scientists struggle to evoke natural emotion in a laboratory setting. "[Darwin's] findings aren't just historically interesting they are actually still guiding our thinking about how we develop measures to study diseases right now," says Peter Snyder, Professor of Neurology at Brown University. "We're still using what Darwin found." He has used Darwin's work to create a test for drugs developed to treat schizophrenia. The study has also formed the basis of modern research into disorders such as autism. "You can't help but realise when you study this that Darwin was absolutely an immense intellect," says Prof Snyder. "Very few people really knew that he had done this experiment at all and the actual data tables were buried in a box in the library in Cambridge. "He was truly a genius and he had influence across all sorts of fields, but one of the areas that he is not known for influencing at all is human psychology."